I always like to collect mugs with unique design, fascinating shapes and interesting color-combination. I don't usually just buy for a keepsake but, I always look for something different to bring home with me. We visited the Gateway Arch in Saint Louis, Missouri a month ago and I wander inside the Museum Store. I was looking to buy a mug with Gateway Arch name on it and I found this. 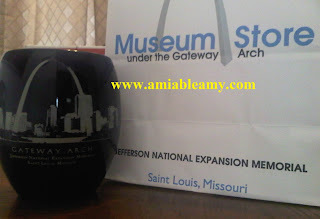 This mug is glossy, has the Gateway Arch skyline print and worth $8.95 only (cheaper than Disney mugs). I bought it inside the Museum Store in Jefferson National Expansion Memorial. It is worth the money for it is durable and the shape is like an oval which is not the typical mug that we often see in the souvenir store. This mug is the latest addition of my collection and I am a happy camper.